It may be cold and wet out, fellas, but those days will soon be behind you. Everyone is wrapped up in wool scarves and dingy suits, right? Well, there is something to get excited about, and that is the wondrous world of spring and summer fashion … it is right around the corner. This coming spring, the first thing you want to trade is the wool scarf for a slender looking poncho. This particular garment was highly popular in the 1970s, and is making a comeback. During the spring months, it may still be too chilly to not wear a coat, so a wrapped poncho is suggested. Be sure, when purchasing, then sporting said piece, to be confident. If you own a solid colored jacket, stick with a slightly patterned poncho. The opposite rules apply for a jacket with a pattern, naturally. On your head, you may feel like wearing a hat of sorts. No, a baseball cap just will not do, but a fedora will work just fine. Fedoras were all the rage in the 1940s and ’50s, then again about five years ago. Guess what? They are en vogue once again. It’s a shame they went out of style to begin with. When deciding what pattern works best, don’t... A fedora should always be of a solid color. Got it? We will get to t-shirts in a bit, but let us discuss more formal attire. Jackets and button down shirts will be colorful and dreamy…think 1990s sitcoms. Light, breezy jackets will come in all kinds of patterns, from large clocks to puffy clouds. In the shirt department, they will come loose and with stripes in all fantastic colors of the rainbow. With a dress shirt, you will need a tie. Men’s neckties are widening up, very much like how men wore them in the late 1970s and early 1980s. Back then, patterns were prominent, but now, it’s best to stick with solid colors. A larger tie also says that you are confident and willing to take chances…okay, maybe not, but you will look like you follow fashion trends. That has to count for something. You are getting geared up about what’s to come, we know it. We did not really discuss the shoe situation; brace yourselves. It will be okay to wear sneakers and dress shoes without socks. You read it here first. After the humdrum of a long, freezing cold winter, feet want to be playful and free. Men will be taking themselves less seriously with this fashion statement. 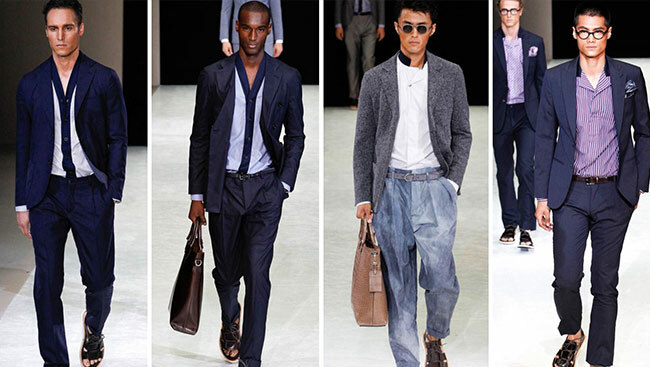 Men still love to dress down, and the look is not just for weekends anymore. All around the country, men are sporting denim jeans and clean t-shirts to their jobs – ones that aren’t as “corporate,” of course. If you are looking to feel more comfortable in your own skin, check out the new clothing line by Bad Etiquette. They’re a local brand in Toronto which feature hoodies and t-shirts galore and you can order them online from their website. Bad Etiquette also has a line of screen printed shirts for sale; one of the sayings is “Illionaire,” and it is plastered right on the front of the garment. If you decide to dress down, do it with class. Pair a t-shirt from Bad Etiquette, let’s say, with a slim fit denim pant, and brown dress shoes. On the top, remember you are stillat the office, you are still a professional, so top the outfit off with a striped blazer. When unsure as to what your jacket size is, it is best to seek professional help in a local tailor. Have you been following the trends thus far? Remember to attempt to get out of your comfort zone; it’s healthy to express yourself in different ways from time to time, and fashion is a great avenue in which to try this out. What will you be wearing this spring? Trade some old clothes for a few of the suggestions we have made here, and see how it fares. We bet you will look and feel like a million bucks…or at the very least, a more warmer, happier you, as we’ve finally left the winter months behind. After attending shows, scouring the internet, and well, downright people watching, the consensus is in: Women will take the cake in the upcoming months. 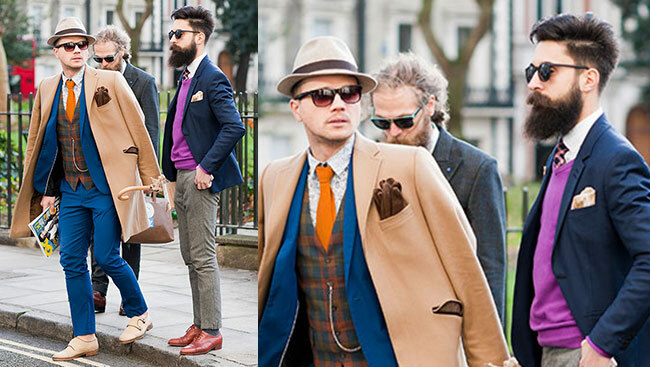 Men are sporting drab, dark, and funky items, and women are just having fun. It’s a beautiful juxtaposition. Best Beauty Gifts This Holiday Season! Holiday Gift giving: Find a beauty gift for everyone on your list!